An unidentified collector's mark (L. 619a). Professor J. Isaacs; Sotheby's London, 12 March 1964, lot 140. Anon. sale, Christie's London, 19 April 1988, lot 55. M. Mahoney, The Drawings of Salvator Rosa, New York, 1977, p. 277, no. 22.4. Mahoney dates this sheet to the early 1640s, and notes that the sheet bears a form of monogram unique in the artist's work. 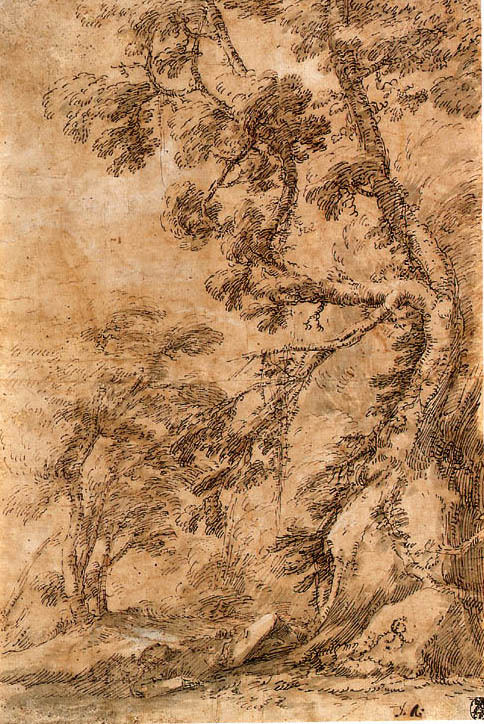 The theme of a man resting under a tree and becoming lost in Nature can be found in another drawing at the British Museum drawn on vellum, M. Mahoney, op. cit., no. 23. 1. The attribution to this sheet and the following three lots was confirmed by Michael Mahoney during a visit to the owner's collection 26 April 1999.